Recently I went on a road trip across the US and it was such a great experience. You will know it when you go for the thrill and new roads that await you. I had the best days of my life along with my partner and our great companion “the ford expedition”. The wheels were truly amazing and could roam across any terrain just so smoothly. In particular, I also liked the comfort offered by Kamp-rite self-inflating pad that fit into my wheels perfectly. These self-inflating pads are just amazing and the whole trip was a memorable one with ample sleep, rest, and relaxation with nature besides. If you love to go on expeditions and conquer new terrains or if you love, outdoors more than the odd mechanical life that we lead then you will need some accessories to get going. The best companions are a perfect vehicle like my ford expedition and the best sleep partner “Kamp-rite self-inflating pad”. To know more about these self-inflating pads keep reading. Package includes a stuff bag with carry handles, which makes it easy to carry around. How Did I Feel Sleeping On A Kamp-Rite Self-Inflating Pads? Well, the feeling is good but not great or extraordinary. However, it is the best sleep I have ever had in ages while outdoors. I have tried different sleeping pads and have never felt so comfortable. I even stayed at a hotel for two days in between the road trip and I felt that the Kamp-rite pad offered better sleep than the luxury mattress at the bedroom. Kamp-rite mattress offers the right sleep without much accessories and fancy attachments to it. Kamp-rite is a simple pad that contains foam and the best way to achieve comfortable sleep while outdoors at a reasonable cost. How Does The Kamp-Rite Work, How To Inflate The Pad? You will have a rolled up pad in your hands, which you need to just, open. It has a high-density open cell foam structure that inflates into a 4-inch thick pad. This is one of the thickest yet reasonable price-sleeping pads available. It has air valves that allow air inside and inflates the pad while you roll it out. Once the pad inflates, you will have to close or recap the valves to hold the air tightly inside the foam cells. There your perfect sleeping partner is ready to have you in for a cuddle. How To Rollback The Kamp-Rite Pad? That is another easy task and it just takes a few minutes if you learn to do it properly. First, you need to open the air valves. After that slowly roll the pad in a tight manner, this will help to push the air inside. You will have to roll it tightly as possible to have a compact deflated pad. Also, cap the air valves once you roll it, as it will prevent air from entering the pad. Now store it wherever you want and get into action. It is that simple and easy to do. As I said before this is the thickest and most comfortable self-inflating pads in the marketplace and I bet you will not see another like this. It has a velour top and has high-density open cell foam, which is about 4 inches thick. It offers ample space and comfort to sleep while outdoors. The best feature I love about this pad is the self-inflating method. The valves do all the job of letting air, in and out. It is easy to deflate and inflate the pad almost anywhere you go. You do not have to carry air pumps and other stuff that are annoying. This whole pad is easy to store in your vehicle and carry around as it compactly gets into the stuff bag. The stuff bag has carry handles that help you to carry along while trekking inside a forest or places where your vehicle cannot reach. We have a double sized inflating pad and me and my wife has a bliss time at sleeping out under the wide-open sky. Trust me life seems to be simple and happy when you go where you belong to. For us, the trip was life changing and we connected more with nature without compromising on our comfort. Why Should You Buy Kamp-Rite Self-Inflating Pad? It is a comfortable mattress like a pad or better than a mattress, I would say. It comes in different sizes like the queen, double and single. Moreover, it does not cost much and affordable in all terms. It is comfortable when on low air as well as full air. It is durable, as I have used it almost every single day and night during the road trip. We had used it roughly and it has stood the test of the time. The best part is you do not have to spend your valuable time Pumping air to inflate it. Just roll it down and open the valves your mattress is ready to hold you. If you have an SUV, it perfectly fits into the back of your vehicle and you can literally go anywhere you want without depending on hotel rooms. You can save many pennies just like that. It gives you the feel that you are sleeping on something that has a cushion-like feel and keeps your pressure points off the ground. Even though am very satisfied with the product it does have small flaws that are not worth mentioning. However, I thought I would write a full review so that others can also understand how good or bad this pad is. Sometimes it does not roll back perfectly and you will have to spend some extra 5 minutes doing the job. My partner finds it difficult to fold it, as it does not roll it back tightly if you do not apply a little pressure. Apart from that, this self –inflating pad is just a masterpiece one can own. I would not mind buying it again or recommending it to others because it is worth buying. You can buy Kamp-rite self-inflating pads from Amazon or other affiliate sites like livewellsports.com. You can choose the preferred size and place your order along with discount coupons if you have any. You will receive your product within two to three days if you live in the US. I got the delivery at the prompt time and the packaging was too good. This product is a must buy if you love trekking outdoors without depending on hotels rooms that are so costly. The majority of the customers who bought this product love this to the core. They say that it gives them wings to fly where they want without spending money on hotel rooms. All they have to do is pick some fuel for the wheels and get going. You can literally visit any remote place without the need of compromising on your comfortable sleep. Whether on a mountaintop or inside your vehicle, your self-inflating pad gives you the perfect sleep at a very low cost. 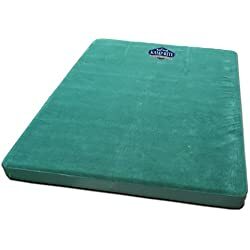 Kamp-rite self-inflating pad is a decent sleeping pad that is simple and easy to handle. It easily rolls down and gives you a perfect place to sleep. You will not find much to complain about this pad as it is worth for the money. It had the perfect thickness that keeps you off the ground and lets you sleep without paying huge bills for the hotel rooms. It is a great package that comes with a bag and a repair kit which you can carry anywhere you want to go. Overall, this is a comfortable pick for a perfect road tripping. It is worth buying for its reasonable price and comfort level. I would certainly recommend all to buy this pad and have a great time.